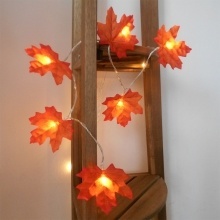 This maple design string light with warm white LEDs is designed for festival, theme parties and home decoration. It will enhance the romantic atmosphere for an instance. Sincerely hope that you will have an unforgettable party with it. ATTRACTIVE DESIGN: Realistic maple appearance, clear vein makes it gorgeous. USB POWERED: Operated by USB cable, no need extra wires, cost-saving, user-friendly. IDEAL GIFT: You are sure to surprise your families or friends if you send them this gift. EYE CARING: It emits soft and tender warm white light and there is a vivid and realistic maple surrounding the light thus you needn&apos;t worry about flickering or eye dazzling. WIDE APPLICATIONS: Decorate dining room, bedroom, bar, club, yard, garden, wedding, venues with this beautiful starry warm white string light.